In late August I will walk for several days along Skjern River with my colleague and good friend Thomas Juel Clemmensen. We will walk some 100 km from the source of the river towards the windbeaten west coast of Denmark where the river flows into Ringkøbing Fjord and the North Sea. Our walk will begin in Tinnet Krat and end in the Skjern River Delta. For a river walker Tinnet Krat is a special, almost mythical, place. Here both Skjern River, Denmark’s largest river in terms of flow, and Gudenåen, Denmark’s longest river, begin their watery journeys only a few 100m from each other. The two rivers are seperated by the watershed running along the topographical spine of Jutland. While Skjern River flows westward crossing the flat plains of western Jutland, Gudenåen flows northeastward through the hilly and forested countryside of the Danish lakeland district towards the east coast. Some of his research builds upon the renaturalisation of the Aire River outside Geneva, which we visited together for the second time in 2013. Here we walked the river from its source in Mont Saléve to Geneva. 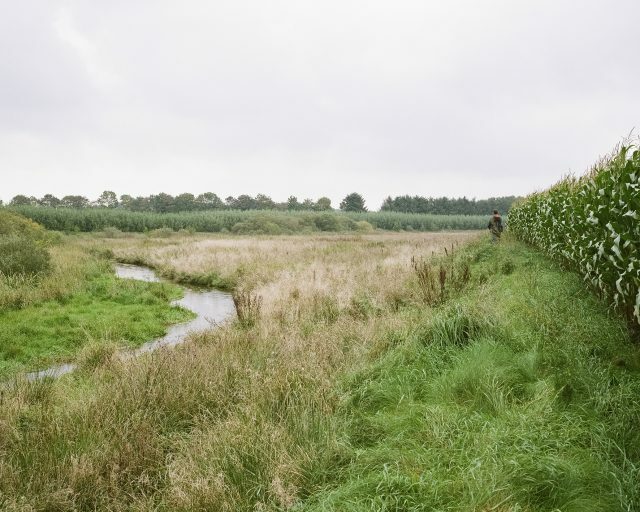 During this walk I completed my Aire Walk Series, the first of several series of photographs on rivers – and the highly cultivated landscapes they traverse. So walking Skjern River together with Thomas seems to be a fitting sequal for our shared river walking and a photographical continuation of my expanding river series. Two rivers, two watersheds, two walks.